This interview was done in 2009 and is also published in The New Earthwork: Art, Action, Agency (2011), edited by Twylene Moyer and Glenn Harper, with the title "Trans-species art: A conversation with Lynne Hull" published by University of Washington Press and the International Sculpture Center, publisher of Sculpture magazine. Lynne Hull specializes in sculpture that doubles as wildlife habitat. She has made safe roosts for raptors in Wyoming, butterfly hibernation sculptures in Montana, salmon-spawning pools in Ireland, and nesting sites for wild ducks and geese in the Grizedale Forest Sculpture Park in England. Carved hydroglyphs capture water for desert wildlife, and floating art islands offer an inviting habitat for all sorts of aquatic species, from turtles and frogs to ducks and herons, to songbirds, swallows, and insects. Lynne Hull. 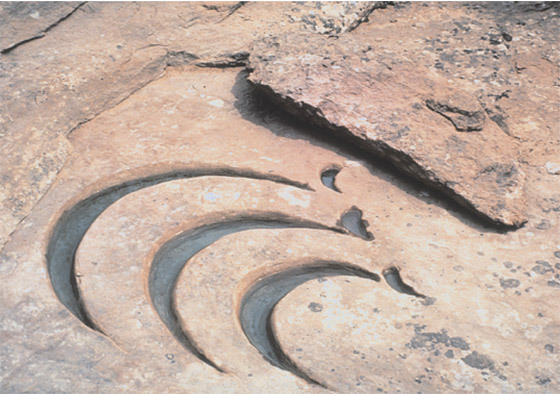 Twist (detail), (1993). Wood, 30 ft. high. Click to see a 2011 Twist update. For over 35 years, Hull’s mixed-media work has focused on ecological realities in the American West and at sites around the world. Her “clients” include hawks, eagles, bats, beavers, spider monkeys, and migratory birds traveling from Canada to Latin America, but she pays attention to even the smallest creatures. For instance, in 1993, she made perches for frogs, toads, and newts who were having trouble climbing out of an abandoned swimming pool. She placed rocks for shelter and basking, planted aquatic vegetation, created a driftwood island, and wittily titled this new world The uglies lovely. Lynne Hull has worked with a number of agencies over the course of her career, including state wildlife departments, the Forest Service, the Bureau of Land Management, and the National Park Service. She has completed projects in 14 states and eight countries. The exiled oxbow (1995–97), created in collaboration with the Salina, Kansas, Parks Department, the Arts and Humanities Commission, and the Land Institute, features native prairie and wetlands restoration along a bend in the Smoky Hill River, where the river was cut off from the main channel by massive flood dikes. In 2008, she finished East Drake pondworks, a public art commission featuring 16 sculptures in the city of Fort Collins, Colorado, north of Denver, where she lives and works. R. J. Preece: What inspired you to make art focused on wildlife? R. J. Preece: What keeps you coming back to art focused on environmental concerns? Lynne Hull: I am convinced that the loss of biodiversity is the most important survival challenge that we face as a species. And I believe that artistic creativity can be applied to real world problems and have an effect on urgent social and environmental issues. I am increasingly aware that, in order to survive, other species need a change in human values and attitudes. I hope that my work offers models for more equitable solutions. R. J. Preece: Have there been practical challenges over the years? Lynne Hull: Absolutely. Those challenges include funding, getting permission to do the work on site, and finding collaborators or consultants to advise on wildlife in the area. Working in certain countries at certain times has also been tricky. For example, I’ve had concerns about my personal safety at particular times in Kenya, Colombia, and Northern Ireland (in 1993–94). Lynne Hull art: Scatter, (1987). Carved sandstone, 48 x 36 x 3 in. R. J. Preece: Scatter (1987) combines art and water in the form of a hydroglyph. What was required to organize and complete this work? Lynne Hull: The main issues were finding the right site and getting the property owner’s permission. Also, I was down on my knees hand-carving in hot desert situations for days at a time. When I want to make a hydroglyph on public land, I have to get an environmental impact approval to do the work— another type of challenge. Lynne Hull. 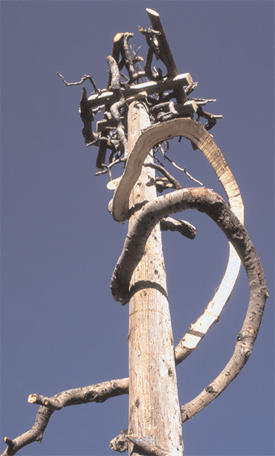 Lightning Raptor Roost, (1990). Wood, metals, and latex skin, 20 ft. high. R. J. Preece: What kinds of animals visit these works— and when? Lynne Hull: It depends on the piece. Small mammals and rodents visit Scatter at night, and birds visit during the day. I once found mouse droppings around the edges of a hydroglyph called Deer Ledge Hydroglyph (1987), and an owl had built a nest in a crevice nearby. I like setting up life webs, where different species support and interact with each other. R. J. Preece: What were you considering in terms of function and form when developing Raptor Roost L-2 (1998) and Lightning Raptor Roost (1990)? Lynne Hull: For the roosts, I consulted with raptor biologists who understand the specifications that the birds seem to need or accept. Then, I worked out the aesthetics within those parameters. My background as a potter contributed to this approach. For example, a teapot has to hold hot water, have a handle so you don’t burn your hand, and a spout that pours and doesn’t drip. 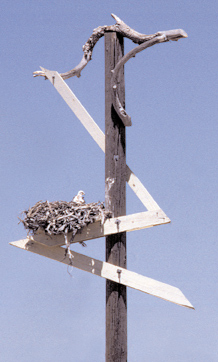 Similarly, birds have certain needs, like the size and height of the nesting platform necessary for the specific nest to fit. If the elements are too big or too small, certain birds won’t use the sculpture. I often build a model and experiment with the shapes until they look right to me. Lightning raptor roost was inspired by lightning strikes, which are a dominant element in that landscape. Raptor Roost L-2 was inspired by found objects from a deserted homestead, and the colors came from the landscape. Lynne Hull art: Duck Island, (1998). 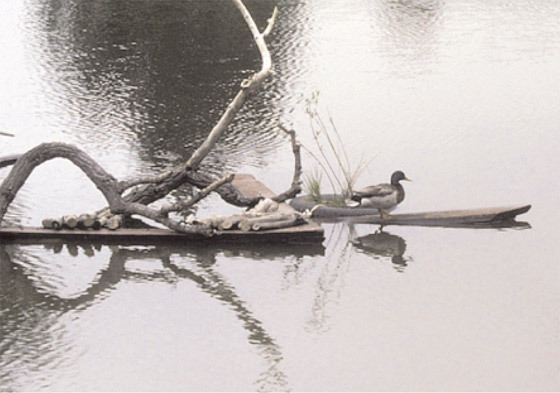 Recycled wood and mixed media, approximately 12 x 18 x 8 ft.
R. J. Preece: What about the functions of Duck Island (1998)? Lynne Hull: As with the other works, the function sets the brief. In this case, the sculpture has to float, and the more levels that it occupies— above and below water— the greater the number of species that can find a niche to use it. R. J. Preece: Was working on East Drake Pondworks, which is a larger and more formal public art project, a different experience for you? Lynne Hull: It was a very different experience. I was able to work with materials that I hadn’t used before, like concrete, metal, and water infrastructure. I also worked with several subcontractors. R. J. Preece: What are some newer projects? Lynne Hull: I’m currently working with Yolanda Gutiérrez in Mexico and Patricia Lara in Colombia. We call ourselves “3 Artistas.” We want to construct “Migration Mileposts,” linking communities in the hemisphere that share migratory birds through a variety of conservation and awareness-raising projects in each country. With the economy, we’re facing challenges like many others, but we’re hopeful. Lynne Hull: The Internet has changed things a lot. Communication is a lot easier; for example, I’ve been talking with interested people in Mongolia. I’m thinking about becoming more available on-line for talks and offering more on-line presentations and tutorials, in addition to making trips. It’s about getting the ideas and the work out there. If this inspires a new generation to take my ideas further into their own environments, then that’s great. Lynne Hull: It’s totally been about heart and soul. Of course, you have to be very analytical, in addition to working with aesthetics. But I’ve come to think of my sculptures as eco-atonement for the loss of wildlife that humans have caused. This is my art, but it’s also spiritual work. This is what I contribute.